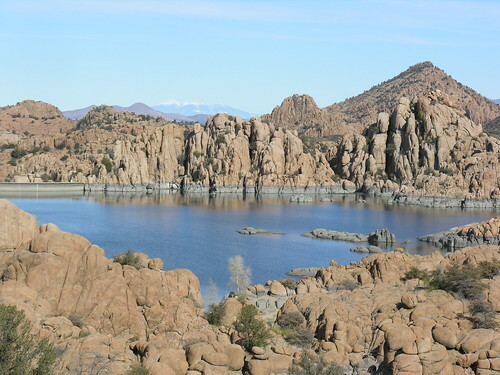 Actually, the location is called Watson Lake Park just north of Prescott Arizona. 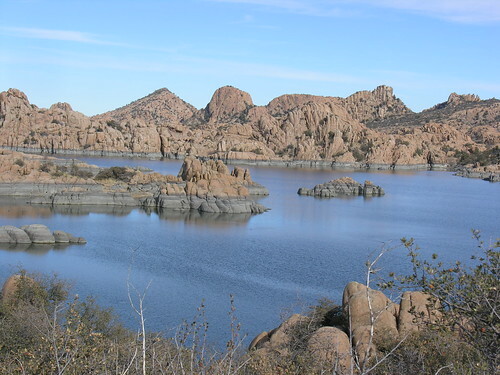 Whatever it is called, I find it breathtaking.Obviously, the result of some geologic upheavals, Granite Dells is a lake ringed by rounded boulder structures that look like they have been plopped there by giants – or a volcano. Off in the distance, sometimes even in summer, a snow-capped mountain is visible to the north. In the last few years, the water level has come down. This is evidenced by the gray ring at the base of the exposed rocks. However, just hiking around the perimeter is inspiring. During warmer weather, boaters take to the water and the sails make very picturesque view. I’ve been back several times, so you know it is a great place to visit. The park has a fee. There are picnic tables, barbecue grills, restroom facilities, camping, boating rentals, fishing, horseshoe pits, playground equipment, hiking trails and a sense of peace and nature you won’t get many places. People are generally respectful of the environment. Much busier in the summer than other times of the year, Granite Dells is a place to add to your itinerary when you’re in the Prescott, Arizona area. Location: 4 miles north of downtown Prescott on State Route 89. This entry was posted on Monday, January 4th, 2010 at 6:00 am	and is filed under Arizona, Family Fun, Hiking, Mountains, Romantic Locations, Scenery, Southwest, Travel. You can follow any responses to this entry through the RSS 2.0 feed. You can leave a response, or trackback from your own site.